The Giants have acquired infielder/outfielder Breyvic Valera from the Orioles for cash considerations, per announcements from both teams. Valera’s addition puts the Giants’ 40-man roster at 39. The Orioles designated the 26-year-old Valera for assignment Friday, though his stay in limbo didn’t last long. He’ll now reunite with Giants president of baseball operations Farhan Zaidi, who was the Dodgers’ general manager when they acquired Valera from the Cardinals last April. The Dodgers then dealt Valera to the Orioles last July in a package for superstar Manny Machado. The switch-hitting Valera didn’t accrue much playing time with St. Louis, Los Angeles or Baltimore, as he totaled 86 plate appearances and batted .216/.286/.243 with no home runs. But Valera has acquitted himself well at the Triple-A level, where he has slashed .301/.368/.427 with 17 long balls in 1,110 PAs, and has garnered notable minor league playing time at second, short, third and in the outfield. Now Valera – who has a minor league option remaining – could vie for a utility role in San Francisco, which is low on infield/outfield depth in the bigs. The Orioles have claimed right-hander Austin Brice off waivers from the Angels, as announced by both teams. In a corresponding move to clear roster space, the O’s have designated infielder Breyvic Valera for assignment. Baltimore now has a full 40-man roster. This is the second time the hard-throwing Brice has switched organizations this offseason, as he was claimed off the Reds roster by the Angels back in November, but then DFA’ed by the Halos last week once they signed Jonathan Lucroy. Brice, 26, has a 5.68 ERA over 84 career innings with the Reds and Marlins from 2016-18. His main issue at the big league level has been the home run ball, with an ungainly 1.9 HR/9 over the last two seasons. Despite his homer woes, Brice has generated ground balls (career 51.2% grounder rate) at an above-average rate. It’s a fairly low-risk acquisition by the Orioles, who will be exploring any number of young players as they begin their rebuilding process. Valera has a .529 OPS over 86 career Major League plate appearances with the Orioles, Dodgers, and Cardinals, and he is perhaps best known for being included as part of the trade package L.A. sent to Baltimore last summer for Manny Machado. Turning 27 next week, Valera does own a pretty solid .299/.357/.388 slash line over 3659 career minor league PA and he offers some utility depth. Valera has spent much of his pro career as a second baseman, though he has experience playing any position on the diamond except catcher and pitcher. Another AL playoff team will be white-knuckling it today, as Yankees manager Aaron Boone announced that Didi Gregorius tore cartilage in his wrist on a slide home yesterday and may not return this season (h/t Bryan Hoch of MLB.com). He’s since received a cortisone injection, and while there’s no definitive word on his status for October, the news is ominous and unwelcome to a Yankees ballclub that would definitely like to be at full strength as they attempt to secure home field advantage over the A’s in a return to the one-game Wild Card playoff. Add Orioles infielder Breyvic Valera to the list of players whose status for the season’s final weeks is in doubt. X-rays showed a fracture of the second metacarpal in his left index finger, per Roch Kubatko of MASNsports.com. Valera was one of five players to join the Orioles as a component of the trade that sent Manny Machado to the Dodgers. He’s collected nine hits (all singles) in 38 plate appearances since coming to Baltimore, chipping in a stolen base along the way. Pirates outfielder Starling Marte departed today’s game with left calf tightness. The two-time Gold Glove award winner has hit .277/.322/.452 with 19 homers and 33 steals in 576 plate appearances in 2018, and while the Pirates were eliminated from playoff contention with a loss in that game, they’ll surely be hoping the injury to Marte isn’t serious. Needless to say, he’s a vital component in their contention plans for the 2019 season, and as we await further word on the details, the Pittsburgh fan base will surely be hoping that a late-season calf issue doesn’t disrupt that. 8:07pm: Both the Dodgers and the Orioles have officially announced the deal. Valera has been optioned to Triple-A Norfolk, while the other four prospects involved will report to Double-A Bowie (h/t Rich Dubroff of BaltimoreBaseball.com). 6:17pm: After a small medical holdup involving one of the prospects coming back, the Dodgers have acquired All-Star shortstop Manny Machado from the Orioles. Outfielder Yusniel Diaz is the key piece headed back to Baltimore in the deal. They’ll also receive minor-league right-handers Dean Kremer and Zach Pop, along with infielders Rylan Bannon and Breyvic Valera. The Dodgers will take on the entirety of Machado’s remaining 2018 salary, which checks in at about $6.3MM. 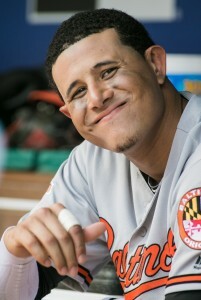 Though Machado, 26, broke into the league as a third baseman, he was drafted and developed as a shortstop and only moved to the hot corner due to the presence of J.J. Hardy at shortstop early in his Baltimore career. Machado voiced a strong preference to move to shortstop this season, and the Orioles accommodated that desire this winter, although defensive metrics have painted him in a dismal light (-19 Defensive Runs Saved, -7.7 Ultimate Zone Rating). It’s also possible, of course, that Machado’s glovework at short will continue to sharpen as he continues to re-acclimate to his natural position after spending years as one of the game’s premier defenders at third base. Eduardo A. Encina of the Baltimore Sun first reported that the agreement was in place, moments after Roch Kubatko of MASNsports tweeted that it looked like a deal would go through pending some final points to review. Jeff Passan of Yahoo Sports was the first to report that the deal was finalized and that players were being notified. J.P. Hoornstra of the Southern California News Group had the first report on the inclusion of Diaz, Kremer, Pop and Bannon in the deal. Ken Rosenthal of The Athletic was the first to report that Valera was headed back to Baltimore, and was also first to mention that the Dodgers were taking on all of Machado’s remaining salary. The Dodgers have acquired infielder Breyvic Valera from the Cardinals for minor league outfielder Johan Mieses, according to an announcement from St. Louis. The 26-year-old Valera spent a bit of time in limbo after the Cardinals designated him for assignment on Wednesday. He’s now set to join his second major league organization since signing with the Redbirds as a Venezuelan prospect in 2010. Valera saw minimal time in St. Louis (11 plate appearances, all of which came last season), but he climbed to the Triple-A level in 2016 and impressed there through last season. The switch-hitting Valera owns a .323/.386/.438 line in 727 PAs at the minors’ highest level, and with a pair of options remaining, he should serve as Triple-A depth with the Dodgers. Mieses, 22, signed with the Dodgers out of the Dominican Republic prior to the 2013 campaign. He then had some success at the minors’ lowest levels through last season, when he batted .353/.411/.707 in 129 PAs in high-A ball. But Mieses struggled mightily in his first Double-A action – .160/.246/.347 in 329 plate trips – and did not rank among the Dodgers’ top 30 prospects at MLB.com. Mieses will begin his Cards tenure at the Single-A level, they announced.